So after much consideration and coercing on some people's parts, I've decided to jump on the medium bandwagon. I know that I'm going to post once a month on there, (because I'm not into giving away all of my goodies on someone else' site for their gain). 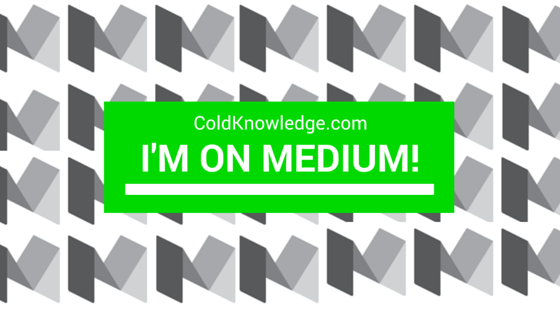 But if you were wondering you can check out my profile here Medium.com/@ColdKnowledge and see what I've written lately. So far the only post that I have up is that of My Heroes Are Not Your Heroes, which I really like. So check that post out and there should be more on the way from me. If you have any ideas on what you want to see up there then just send me an email at Info@ColdKnowledge.com and I'll get back to you.